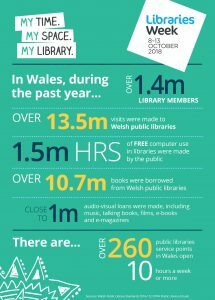 Libraries across Wales will be coming alive this October and showing how they can play a key role in our wellbeing. Across the country, libraries will be hosting guest authors and illustrators, group reading sessions, educational and literacy activities, musical events and much more to entice you during Libraries Week (8-13 October). Libraries Week is the annual showcase of all the creative, innovative and diverse activities that libraries have to offer and this year, with a focus on wellbeing, they will showcase how they bring communities together, combat loneliness, provide a space for reading and creativity and support people with their mental health. 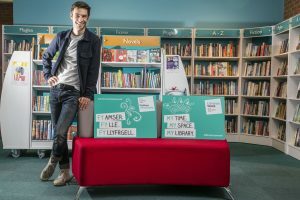 Welsh public libraries have seen a huge increase in their services and in addition to loaning books you can also download e-magazines and audio and more and more of them are offering spaces for people to come together to talk and chat, having identified social isolation as an issue within society. 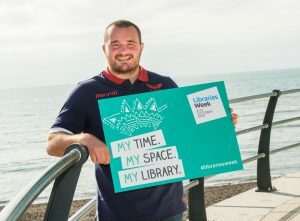 “While Libraries Week is a great chance to discover the range of things you can do at your library, from play and learning for children, to managing your health, to accessing free wifi and games, to finding a job, the focus this year on wellbeing allows us to consider the wider role libraries can play to strengthen our communities. Many libraries are at the centre of people’s lives and they have the potential to transform those lives by allowing a space for experiences to be shared and for promoting learning opportunities. Among other activities taking place this week will be musical gigs, a poetry and illustration day with Wales’s Bardd Plant Cymru (Welsh-language children’s poet of Wales), Casia William and illustrator Valeriane LeBlond and bespoke awareness sessions with dementia and similar support groups at libraries across the country. Libraries Week is a great opportunity to showcase each individual library throughout Wales and with over 250 libraries across the country in many different shapes and forms, large and small, on wheels or within four walls, there is much to discover. We have placed cookies on your computer to help make this website better. You can change your cookie settings at any time using your web browser. Otherwise, we'll assume you're OK to continue.